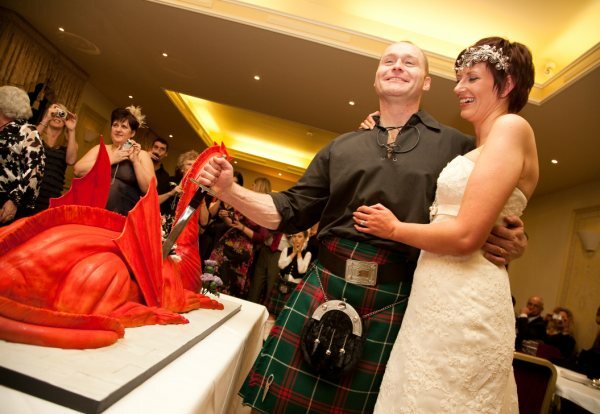 We just wanted to say a massive thank you for creating our fantastic Dragon wedding cake! I don't know if you remember, but the cake was a surprise for Chris, the Groom, and he absolutely loved it. The Dragon was exactly as I'd asked for, and the amount of time, effort and creativity that you all must have put into it was evident. Even the miniature Bride and Groom were so perfect, everyone was so impressed and still talk about it even now. Sorry it's taken us so long to write to thank you, but we wanted to share some photos taken by our photographer and we've only recently received them. As well as looking amazing, it also tasted amazing. 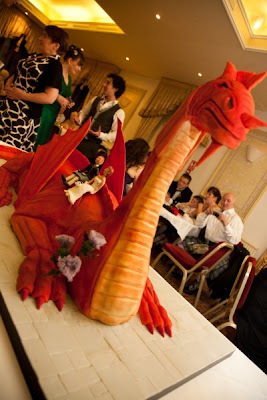 The morning after, the Dragon was laid in the hotel reception with still around half of the cake to eat. The hotel staff were adamant that they salvaged the head…. we still have the head, wings and little Sandra and Chris as a keepsake. Again, thank you for your imagination, your wonderful service and attention to the finest detail. You created a wedding cake that we will never forget.